Though not a First-Aid topic it is included here for convenience’s sake. This page is of great importance to anyone who uses LPG gas. 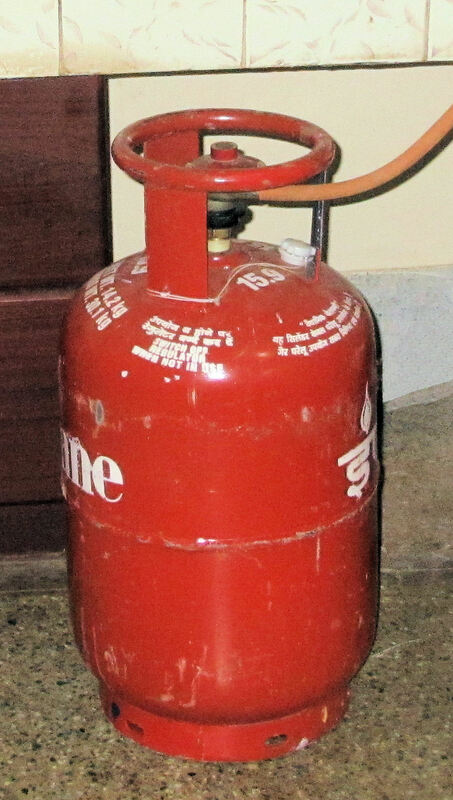 Liquefied Petroleum Gas (LPG) is used as cooking gas in India as well as many other countries. It is one of the extremely dangerous commodities which finds place right inside the kitchen, out of necessity. However, if you strictly follow safety regulations you can prevent all avoidable incidents arising from LPG gas. Do follow the guidelines given by the gas company as well as your country. Let us take a look at one important yet often totally overlooked fact that spells the difference between safety and regret. Some time ago my wife and I visited a young lady who was in a local hospital with burns. Both of her legs had severe burns, almost up to the knees. The story goes like this. There was a mild leak in the gas tube of the LPG stove in the kitchen. So they made it a point to shut off the pressure regulator switch (of the gas cylinder) before going to bed upstairs every night. But they forgot to do this one night; and a sick person in the family wanted a warm drink in the early hours. So the daughter-in-law came downstairs and entered the kitchen. The moment she opened the refrigerator, fire broke out and spread all over the floor up to a foot and a half from the ground, very much like water on fire. She ran through the fire and managed to escape death by climbing the stairs. There were two major lapses in the above case. i. Failure to change the leaking tube of the gas stove. ii. Failure to provide an escape route for leaking gas. How? Read on. LPG gas is heavier than air; hence the leaking gas always flows downward, like water, instead of rising up like CNG (compressed natural gas) or many other gases. Therefore the leaking gas gradually settles down on the floor, very much like water, unless there is an outlet at floor level to let out the accumulating gas. Accumulated gas can be ignited easily, even with the spark from a refrigerator’s automatic switch; which is what happened in the above case. Strictly follow the safety regulations provided by your gas supplier. Also follow the national fire safety guidelines for using cooking gas. Never use substandard material, whether it is the pressure regulator (where gas is not piped), gas pipe or the stove (including its knobs). Keep them always well-maintained and the defective/timed-out parts replaced. Remember Murphy’s Law: ‘If anything can go wrong, it will’. Ensure a big outlet for gas at the bottom of an outer wall in the kitchen, at the floor level. If you already have a water drain pipe for the kitchen floor, that would be sufficient. Make sure that it has a diameter of at least two inches. You can cover both ends of this pipe with wire mesh in order to prevent unwanted organisms entering the kitchen. Those of you who use LPG as fuel for running your cars (or any other closed vehicle), too, must ensure that you provide a gas escape vent at the bottom of the passenger compartment of your vehicle, in addition to strictly adhering to all other safety guidelines.